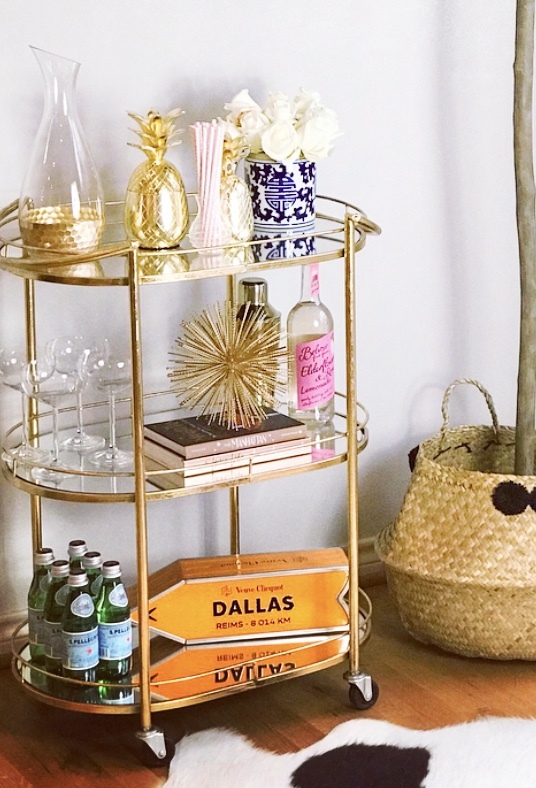 Eleven Bar Cart Essentials to Liven Up Your Hoppe Hour! I’d like to preface this post by letting you know, my last name is Hoppe, (pronounced like hoppy). You will see many punny plays on my name in the future, like my cheesy Jay Z joke above, Hoppe Hour, Hoppe Holidays, Hoppe Easter, Hoppe Birthday, etc. etc. Just wanted to share that bit, so you wouldn’t think my jokes were wack. Now on to the good stuff! I know, I know! 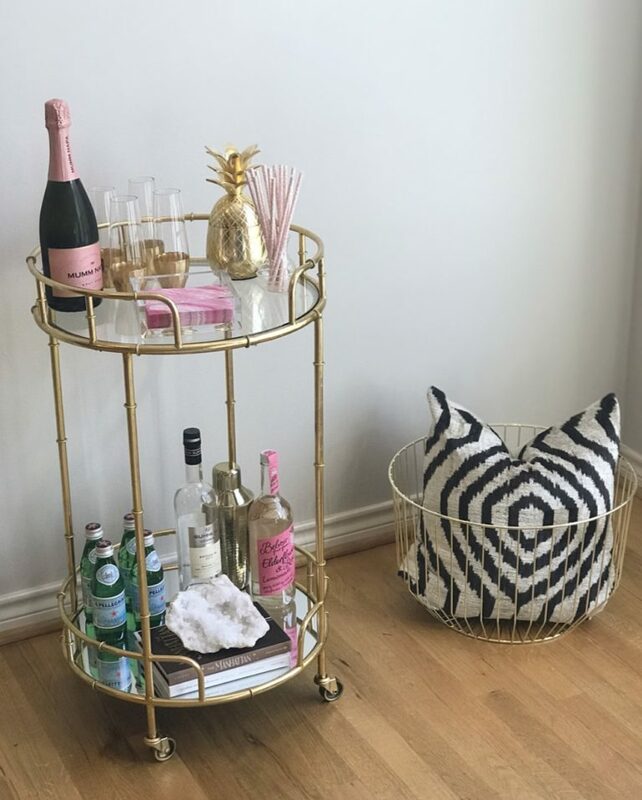 We ALL love a good bar cart, but once you finally decide on the one you want, congratulations by the way, what the heck do you put on it to make it just the right amount of chic?? 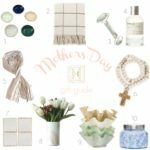 It’s so easy to over accessorize your cart, and quickly. 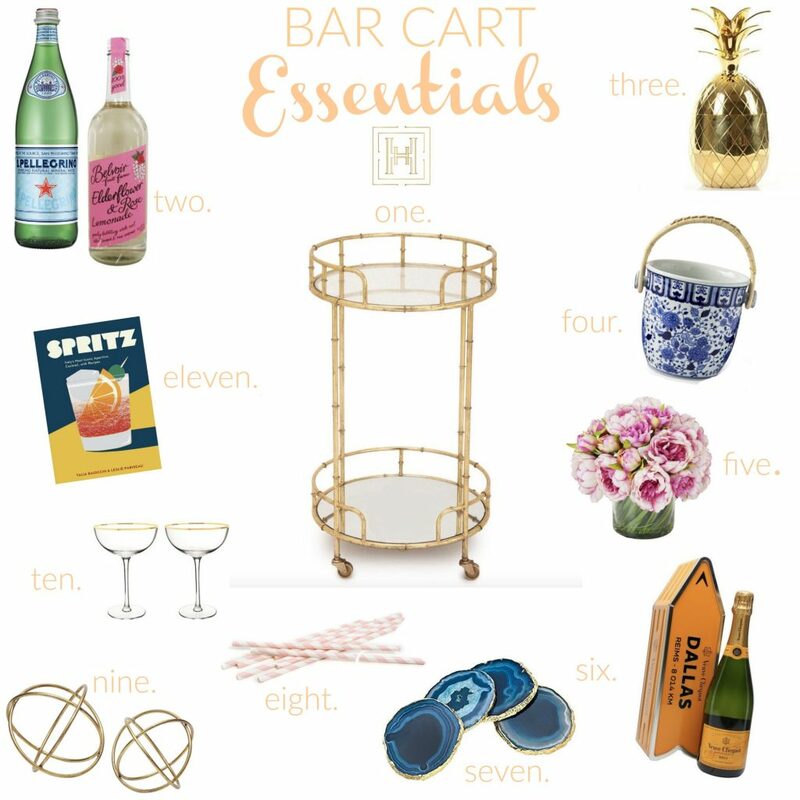 Since we don’t want to cross the line from chic to shambles, I’m sharing with you eleven of my fav bar cart accessories and just how to craft your cart no matter the size! one // a bar cart, obviously! you may want one of these to start. loving the two in the post from the shoppe! 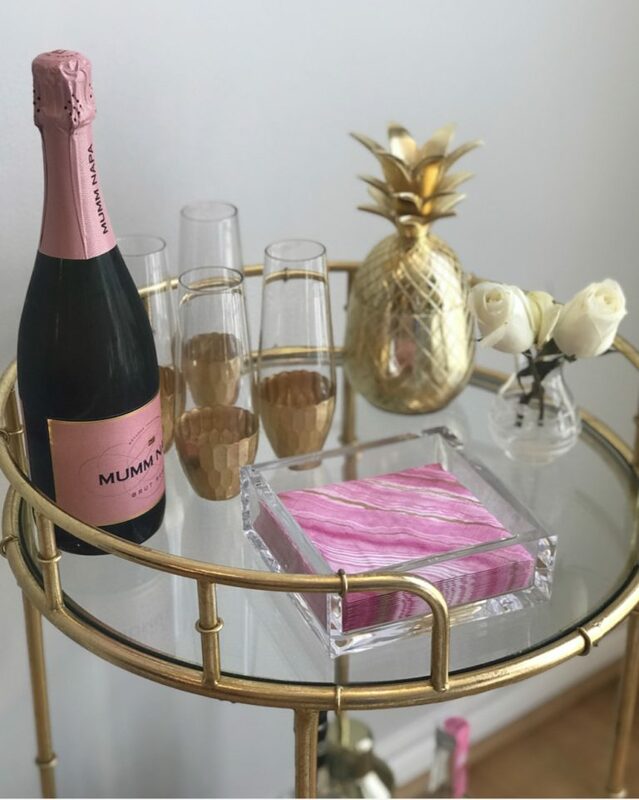 The Rose 3 Tiered Bar Cart which is perfect for a larger space, and the Ella 2 Tier Bamboo Bar Cart, which is ideal for an apartment, smaller space, and fits perfectly in a corner by your dining table or by the wall! two // colorful mixers and liquor bottles are MAJOR KEY. i love the pop of green from the San Pellegrino bottles, and the pink from the Belvoir bottle. there are so many pretty varieties to choose from! three // golden pineapple cocktail cups are the PERFECT touch of fun and stylish for your cart. i’m absolutely in love with these from the shoppe! four // a chic champagne chiller. there are so many options to choose from, and i’m loving this AERIN Ginger Jar Champagne Bucket right now. i’d recommend a narrower one like this Williams Sonoma marble chiller for a smaller cart. five // gorgeous fresh flowers are a must in my opinion. you want something alive to brighten things up. six// how fun are the Veuve Cliquot Journey Edition Arrows?! i love that they had one for Dallas! they have so many cool cities to choose from, and the bright orange really gives your cart a nice pop! seven // stacking crystal coasters like these or like our Agora Collection Marble & Gold Edge Coasters on your cart adds some natural pizzazz, not to mention these look good on your coffee table, and end tables if you are rotating items on and off your cart. eight // patterned paper straws in a cute glass are great for entertaining! 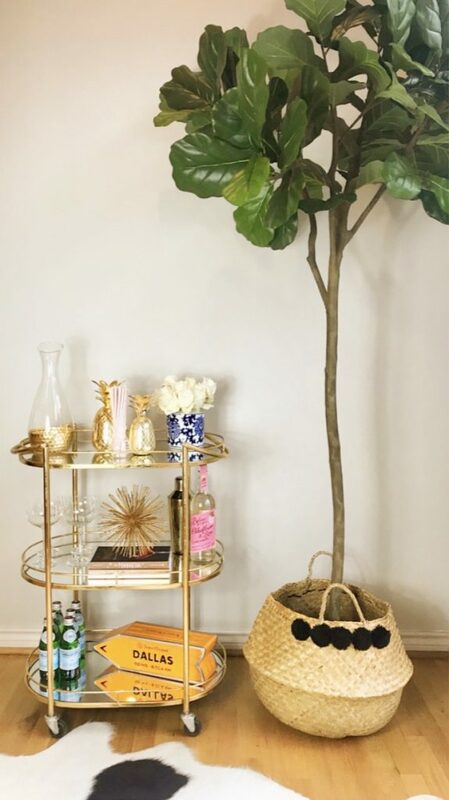 nine // a decorative object like one of these Golden Sphere Orbs, a starburst orb, or even a pretty crystal geode atop your cocktail books is a must if your cart has the space! ten // champagne glasses like these roaring 20’s style gold rim coupe glasses are necessary. if you have a smaller cart, these gold dipped stemless champagne flutes are perfect! The beauty of the bar cart is the fact that you can constantly rotate items, and switch things up depending on the season and holiday! Cute cocktail napkins, bowls of seasonal items like ornaments, or cranberries in the winter, baby pumpkins or candy corn in the fall, vivid oranges in the spring, and lemons and limes in the summer just to name a few! If you have a larger cart, I’d recommend a colorful ceramic bowl, and if your cart is on the smaller side, a crystal bowl is the perfect touch of glass class and adds that floating look to save on space.